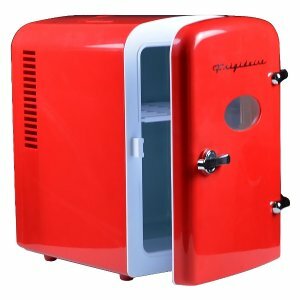 Walmart offers the Frigidaire Portable Retro 6-can Mini Fridge EFMIS129 for $19.92. Features: Keep snacks fresh with this retro-inspired cooler. It has room for your snacks and beverages so you can get you through your big study session or long day at the office. It's designed to easily fit where you need it on your desk, bookshelf or other handy spot.